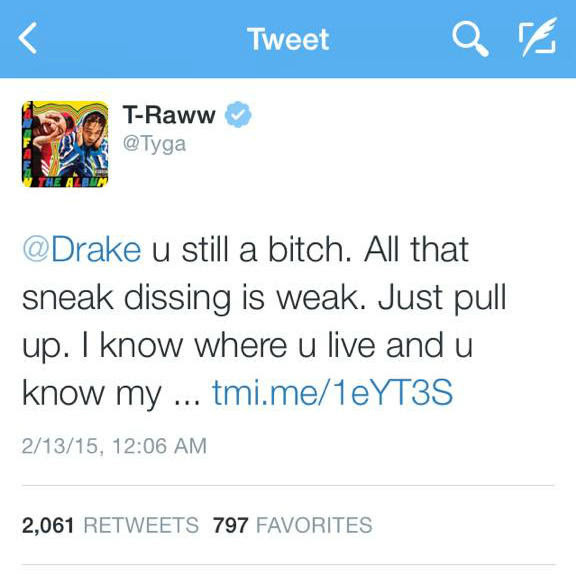 Tyga has responded to a fresh diss from label mate, Drake. OVO co-founder, Drake rolled out a surprise project yesterday, If You’re Reading This It’s Too Late, which concluded with a track ‘6PM in New York’. In the track, Drake said “I heard lil homie talking reckless in Vibe, quite a platform you chose you shoulda kept it inside, oh you tried, it’s so childish calling my name on the world stage, you need to act your age and not your girl’s age.” This not only references Tyga’s comments about Drake to Vibe, which started the beef in the first place, but also Tyga’s ongoing relationship with Kylie Jenner, who is currently 17. Tyga obviously didn’t take this lightly, as he took to his Twitter account to go at Drake, while calling him “weak,” a “bi**h,” and accusing him of running from a fight with Chris Brown. 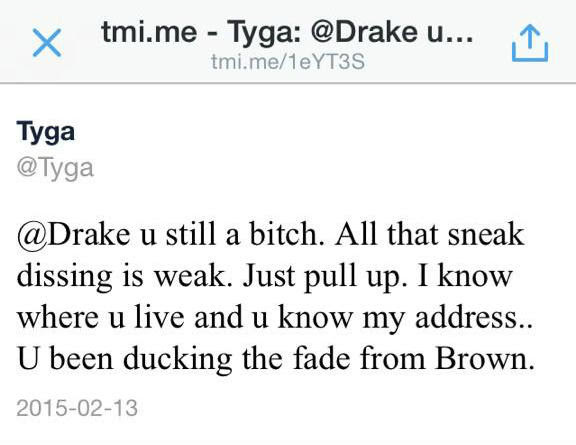 Tyga has since deleted the tweet, but someone was able to get a screenshot beforehand, which you can view below.